The Ireland women's team to play Kazakhstan in the third and final pool game of the IRB Women's Rugby World Cup has been named. Ten changes, as well as two positional switches, have been made to the side that overcame New Zealand 14-17 in their last outing. A new look backline sees Jackie Sheils, Vikki McGinn and Hannah Casey all make their first startsof the tournament. Grace Davitt and Lynne Cantwell retain the centre pairing with Cantwell captaining the side. Tania Rosser moves to out-half with Larissa Muldoon starting at scrum-half. Gillian Bourke is joined by Fiona Hayes and Kerri-Ann Craddock in the front row. 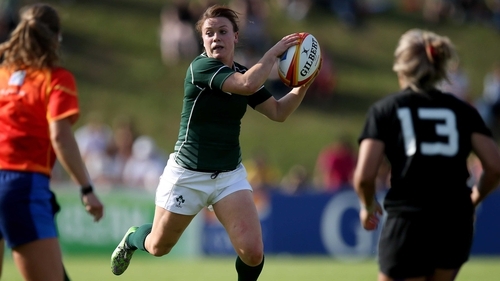 Orla Fitzsimons, who makes her first appearance of the tournament, is named alongside Laura Guest in the second row. Paula Fitzpatrick is named at No 8 and is joined by Sharon Lynch and Siobhan Fleming to complete the back row. Fiona Coghlan, Ailis Egan, Sophie Spence, Claire Molloy, Nora Stapleton, Alison Miller and Ashleigh Baxter are all named in the replacements. Speaking ahead of the test, head coach Philip Doyle said: "Tuesday's win against New Zealand was fantastic and really showed what this team can do. "However, it was one game and we still have a lot of rugby to play. "This World Cup is, and always has been, about our 26-player squad, and we are in a great position that we can use fresh players to maintain our standards and performances to date. Kazakhstan are a hugely physical side and we are not underestimating them, they will not be overcome easily. 16 Fiona Coghlan (UL Bohemians/Leinster) 17 Ailis Egan (Old Belvedere/Leinster) 18 Sophie Spence (Old Belvedere/Leinster) 19 Claire Molloy (Bristol/Connacht) 20 Nora Stapleton (Old Belvedere/Leinster) 21 Alison Miller (Portlaoise/Connacht) 22 Ashleigh Baxter (Belfast Harlequins/Ulster).